> Research Library > DocuSign UK > The Digital Business: What Do Your Customers Expect? With every week that passes, our dependency on paper wanes as digital processes are introduced into every aspect of our daily activity. If you want to sign a contract, book a restaurant or make a bank transfer, you can do so digitally – it is ingrained in our lives. Taking an entire business digital can be more challenging and reliant on many more moving parts. Identifying how businesses are evolving to meet these rapidly changing demands is essential for decision makers across all sectors of the economy to prepare their organisation or department accordingly to undertake successful digital transformations. 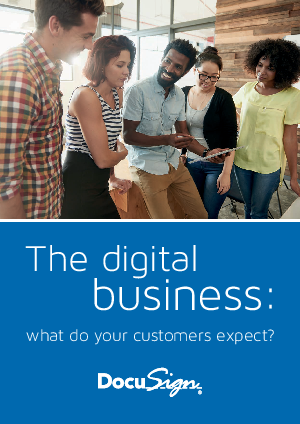 This eBook investigates digital expectations from both the consumer and business perspectives. It identifies what action is being taken to meet the demand in the market and where the main challenges lie for businesses that are trying to deliver the digital experience their customers want.